India’s largest software services company, Tata Consultancy Services Ltd (TCS), has been more successful than rivals, including Infosys Technologies Ltd and Wipro Ltd, in winning large multi-year outsourcing deals worth more than $100 million (Rs397 crore). Thus far in 2007, the company has won four such deals, including a $1.2 billion outsourcing contract (the largest won by an Indian firm) from information and audience measurement firm Nielsen Co. TCS has not disclosed the size of what should be another large deal, this one from Bank of China. 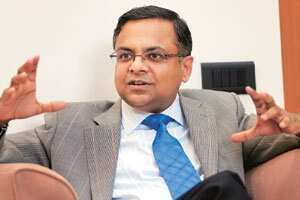 Global plans: TCS executive director and COO N. Chandrasekaran says the company is pursuing at least six large deals in the European market and expects to expand in the Latin American market more aggressively. The number of large deals TCS has been able to win is a reflection of the power of its full-services play, which gives us the ability to manage the end-to-end business requirements of the customer—from IT systems to operations. The power of this full-services model is magnified by our global network delivery model, which allows us to handle complex, multi-location engagements that need to be executed across different regions such as India, Latin America, Europe and China. We have also built a reputation for managing complex projects, from design to delivery, and helping our customers experience certainty, which drives business value. We are (also) simultaneously working on new business models—pay-per-use BPO (business process outsourcing) or remote infrastructure management, or software as a service to boost our abilities to win large engagements. Do you see Europe contributing more than the US in terms of big deals in the near future? Europe remains a very important market for TCS, contributing nearly 29% of our revenues. We are adding new customers and have seen very strong growth in the European market across verticals such as banking and financial services, telecom, pharmaceutical, manufacturing and the utility sector. We have also won some deals in the transportation sector in the European geography. We have a healthy pipeline and are pursuing at least six large deals in the European market. What I consider more important is that we are also focusing on building our local capabilities (in Europe). What is the strength of your workforce at delivery centres outside India? And what are your growth plans for such centres? Currently, we have more than 6,500 people in overseas delivery centres in Latin America, China and Hungary. The significance of the Latin American market is growing with every passing quarter. In this year, we have already announced some significant deals in Mexico ($200 million) and in Chile ($70 million). We have grown to 5,000 people in five years (and) we are seeing good growth in Brazil, Chile and Mexico. We expect to grow in that market more aggressively. As the pioneer in China, we have built a successful franchise in that market with local customers such as Bank of China as well as our global customers. We offer IT services, application development, maintenance and consulting (some aspects) and plan to start BPO operations soon. TCS is building expertise in ERP (enterprise resource planning, a kind of business software) implementation, engineering services, banking and financial services, manufacturing and telecom. We plan to have about 6,000 people in China in the next five years. While China will be a global hub for TCS, we will also focus on domestic business (in China). Now, 600 of the 1,100 TCS China employees work for local clients. On the demand side, do you see any signs of business slowing down, especially on account of a possible recession in the US? It is very difficult to say at this point of time. We remain confident. But we will be very cautious. When everyone is asking (such questions), you remain cautious and watchful. Cognizant Technology Solutions has said it has not seen a ‘budget flush’ (or companies rushing to use up budgets) that happens every year in December. Its outlook for the quarter is muted. Do you also see some kind of impact in the December quarter? TCS does not issue guidance of any sort. We continue to watch the evolving situation in the US carefully, but we have not seen any impact yet. Have any of your customers said anything that sheds any light on this? We have not seen anything negative. Are you looking for any more acquisitions in Europe? We have always maintained we will look for niche, strategic acquisitions that help fill the gaps in our service portfolio (such as FNS, the banking product company we bought in Australia) or help us enter new market segments (such as Comicrom for banking BPO in Chile). We cannot comment about specifics in any market or sector. What is your take on the Indian market? Around 10% of out revenue comes from the domestic market. TCS has always been committed to the domestic market and (has played a part in) building critical infrastructure in the country such as the National Stock Exchange, Bombay Stock Exchange, National Security Depository Ltd, as well as many other institutions. Some of our other clients include State Bank of India Ltd, Indian Bank, Bank of Maharashtra, Union ministry of corporate affairs, BSNL, Mumbai International Airport Ltd. And as the Indian market expands, we will continue to play an important role in it. You have already made offers to 22,000 fresh graduates, who will join you in 2008-09. What is your target for the total number of employees you want to add that year? We have made more than 22,000 offers across 265 campuses in India for people to join us in 2008-09. That is all we can say about this subject at the present time. Do you plan to increase revenue from fixed price contracts (where the customer agrees to pay a certain amount for a project completed within a certain deadline and the vendor is free to choose how many people to deploy, as opposed to time and money contracts, where billing is done per man-hour)? We always maintained that we will do 40% to 50% of (our business as) fixed price (contracts). And it has been hovering around 41% to 46%. You can not do all business in fixed (price contracts). Customers drive the business model.